On this day in 1782, British Royal Governor Sir James Wright, along with several civil officials and military officers, flee the city of Savannah, Georgia, and head to Charleston, South Carolina. As part of the British evacuation, a group consisting of British regulars led by General Alured Clarke traveled to New York, while Colonel Thomas Brown led a mixed group of rangers and Indians to St. Augustine, Florida. The remaining British soldiers were transported to the West Indies aboard the frigate HMS Zebra and the sloop of war HMS Vulture. Wright had been the only colonial governor and Georgia the only colony to successfully implement the Stamp Act in 1765. As revolutionary fervor grew elsewhere in the colonies, Georgia remained the most loyal colony, declining to send delegates to the Continental Congress in 1774. Governor Wright, though, had been taken into custody and placed under house arrest nearly a month earlier on January 18, 1776, by Patriots under the command of Major Joseph Habersham of the Provincial Congress. On February 11, Wright escaped from his residence in Savannah to the safety of a waiting British warship, the HMS Scarborough, anchored at the mouth of the Savannah River, and returned to London. Wright organized a military action and retook Savannah on December 29, 1778. He resumed his role as royal governor on July 22, 1779, and held the city until the British left of their own accord on this day in 1782, following General Charles Cornwallis surrender to General George Washington at Yorktown in 1781. Wright then moved to London, where he died three years later. On May 23, 1782, just over seven months after Cornwallis' surrender at Yorktown, Sir Guy Carleton in New York sent a message ordering the evacuation of Savannah and the province of Georgia, notifying the authorities when transports would arrive. The Royal Council in Savannah responded on June 16 by expressing to General Alexander Leslie in Charleston its "astonishment" at the news. Nevertheless, General Alured Clarke, garrison commander in Savannah, ordered his troops to begin embarkation, starting with the heavy baggage. Consequently, on June 20 the British and Hessian soldiers moved the whole of their heavy regimental baggage to the waterside below Fort Prevost. From June 22 to June 23 they began ferrying the heavy baggage down the Savannah River to Tybee Island in large boats and schooners. From there they took it to the transport ships. Meanwhile, General Anthony Wayne defeated British efforts to break out of Savannah. In July of 1782, as General Wayne's corps lay at Sharon plantation just west of British-occupied Savannah, the Loyalist militia in the city sent a flag of truce out from the British lines "with some overtures." Wayne returned an answer and empowered MAJ John Habersham to offer the following terms: those who chose to enlist in the Georgia Continental Infantry for two years or for the duration of the war in Georgia could rest assured of Wayne's "exerting every influence 'in my power with the Civil Authority, that all past offences (except murder) shall be buried in Oblivion.'" Whig Governor John Martin issued a proclamation that certain Loyalist merchants had agreed to stay in Savannah for at least six months after the evacuation. This agreement provided the Whigs with an immediate source of supplies and, incidentally, enabled those merchants to dispose of their inventories. "HEAD QUARTERS, CAMP AT GIBBONS, July 10, 1782. As the enemy may be expected daily to evacuate the town, the troops will take care to be provided with a clean shift of linen, and to make themselves as respectable as possible for the occasion. The officers are particularly called upon to attend to this order and see it executed in their respective corps. No followers of the army are to be permitted to enter the town until the main body has marched in. Lieut. Col. [James] Jackson, in consideration of his severe and fatiguing service in the advance, is to receive the keys of Savannah, and is allowed to enter at the western gate, keeping a patrole in town to apprehend stragglers who may steal in with the hopes of plunder. Marauders may assure themselves of the most severe and exemplary punishment. " 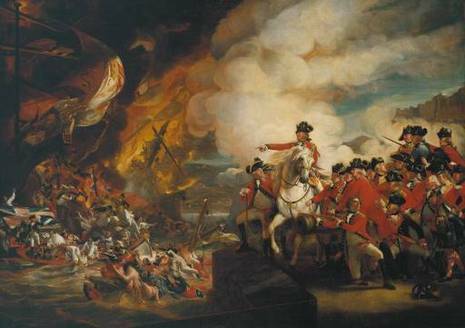 The British began their evacuation of Savannah on July 11, 1782, the whole British garrison marched out of Savannah under the command of Brigadier General Alured Clarke. They moved to the area below Fort Prevost, where they embarked in 60 large boats in the river. That evening, LTC James Jackson and his Georgia Legion received the honor of being the first Whigs to re­enter that city. On July 12 the British completed their move to a cantonment area around the lighthouse on Tybee Island. 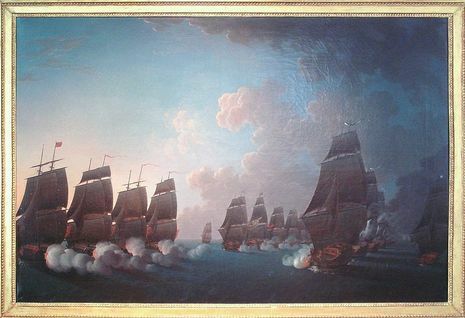 On the 20th of that month a fleet set sail for the West Indies, carrying the Loyalist Militia and the "King's negroes." On the 21st a similar fleet set sail for St. Augustine with the Indians on board who had served with the British, together with the "crackers," as they called their Loyalist allies. On the 23rd the Hessians and rest of the British embarked for New York. During this period the entire British garrison at Savannah, amounting to 1,200 regulars and Loyalists, besides Indians, women, children, and slaves, sailed from Tybee Roads. There remained in the city 240 houses and 750 white inhabitants. The number of black inhabitants is uncertain, since the Loyalists carried away so many of them off when they left. On July 13th the members of the Georgia House of Assembly gathered in Christ Church. In a symbolic session, these representatives of the revived state reclaimed the mother parish.